The space between the first and second name is way larger than the space between the second and third name. The bronze badges of the third name aren't visible, but are present at the source. 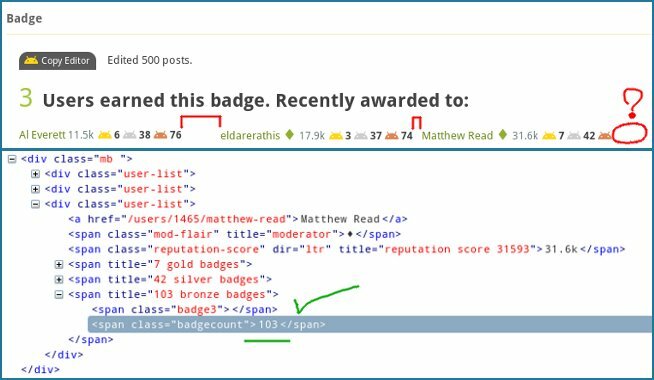 I see this behaviour for the list of users that earned other badges 1 as well, but here, there's no reason as to why the space can't be optimized, since clearly the large blank space between the first and second name could be equalized with the blank space between the second and third name, thus leading to the presentation of the third name bronze badges count. With Google Chrome or Internet Explorer, the first number starts to appear. Browse other questions tagged bug design layout . Why is the font weight bold?